California Insurance Commissioner Announces Rate Cuts for 2019 — Rancho Mesa Insurance Services, Inc. 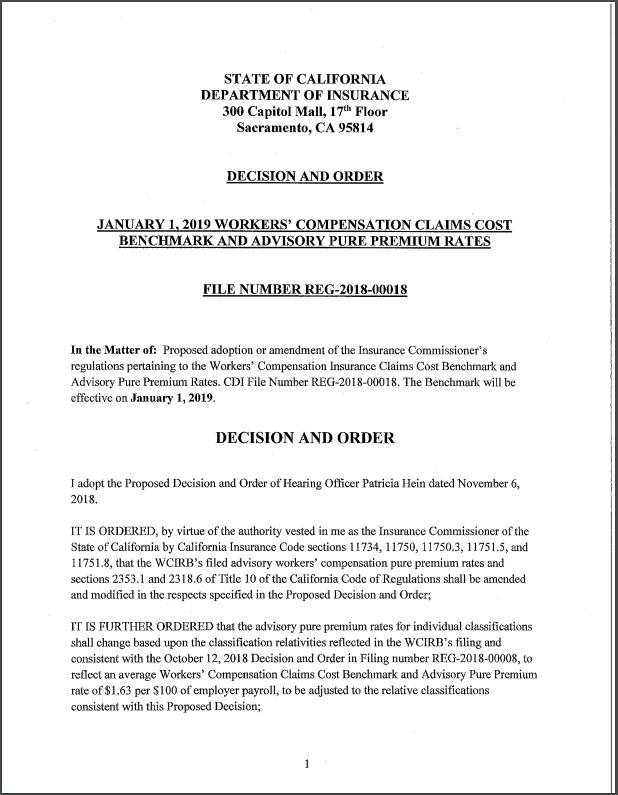 Author, Sam Clayton, Vice President, Construction Group, Rancho Mesa Insurance Services, Inc.
California employers received some great news regarding their Workers Compensation premiums for 2019. On November 6, 2018, Insurance Commissioner Dave Jones recently announced his decision to cut California Workers’ Compensation advisory pure premium rates by 8.4% significantly higher than the initial recommended 4.5%. This change will affect policies that renew or incept on or after January 1, 2019. To learn more about how this decrease will affect your company’s workers’ compensation premium in 2019, contact Rancho Mesa Insurance Services at (619) 937-0164. Older PostWhat is a Surety Bondability Letter? Author, Lauren Stumpf, Media Communications Assistant, Rancho Mesa Insurance Services, Inc.
Rancho Mesa Insurance Services, Inc. recently launched its proprietary RM365 Advantage Safety Star Program™. When launched the program was offered exclusively for the construction industry; however, plans were underway to offer a program specifically designed for human services organizations, in the future. Author, Lauren Stumpf , Media Communications Assistant, Rancho Mesa Insurance Services, Inc .
“As we begin this very special and holy week of Easter, myself and the entire Rancho Mesa family wanted to wish you and your family a very blessed and happy Easter season,” says Dave Garcia, President & CEO of Rancho Mesa Insurance Services. On Tuesday, April 16, 2019, Rancho Mesa Insurance Services, Inc. hosted a Captive Insurance Workshop at the Boys & Girls Club of East County in Santee, CA. Doug Hayden from Captive Resources, LLC, discussed the captive model as a viable insurance option to local business owners. NOTICE: If requesting a certificate of insurance (COI) or Loss Runs, please contact the insured or call us at (619) 937-0164. This form does not process COI or loss runs requests. Thank you! A Rancho Mesa representative will contact you, shortly. Rancho Mesa Insurance Services, Inc. Please be advised that no coverage can be bound or modified by voice mail, email, fax or online via the agency’s website and is not effective until confirmed directly with a licensed agent. © Copyright 2011-2019. Rancho Mesa Insurance Services, Inc. All rights reserved.